Liver fluke disease (fasciolosis) is caused by the trematode parasite Fasciola hepatica. 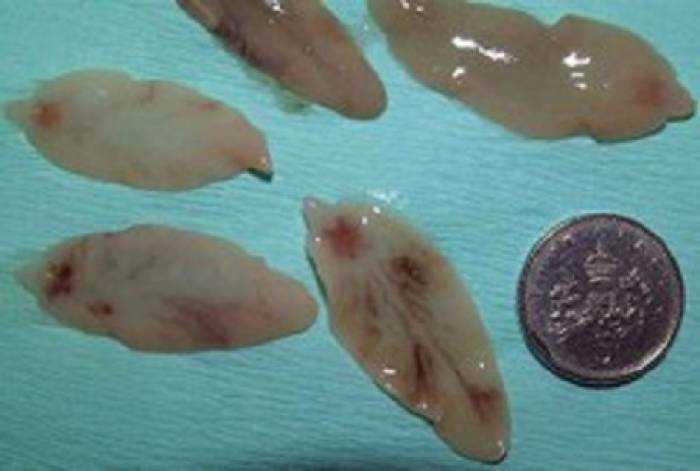 Disease can result from the migration of large numbers of immature flukes through the liver, or from the presence of adult flukes in the bile ducts, or both. Liver fluke can infect all grazing animals (and man) but mainly affects sheep and cattle. It is most pathogenic in sheep. Compared to other helminths, the lifecycle is complex and involves an intermediate host, the mud snail Galba (Lymnaea) truncatula and several free-living stages. 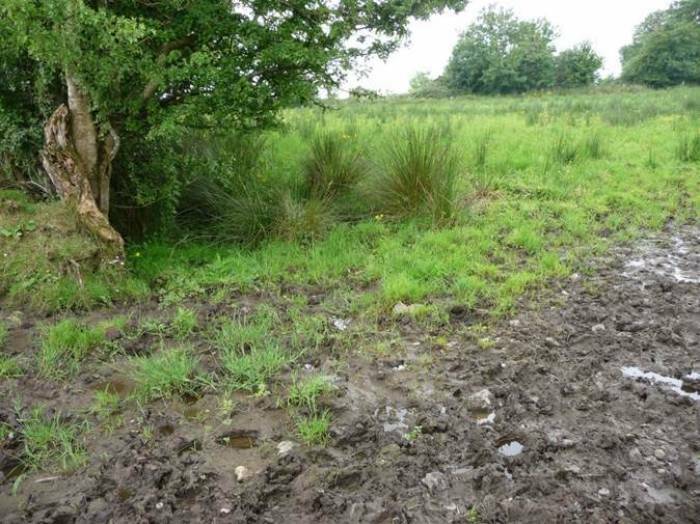 The role of the snail, which prefers muddy, slightly acidic conditions, particularly areas associated with poor drainage, means the incidence of liver fluke is far greater in the wetter areas of the country and in years when there is high summer rainfall. With the capacity of the snail to multiply rapidly (100,000 offspring in three to four months) along with the multiplication of the parasite within the snail, there is potential for very large numbers of parasites. Adult fluke lay eggs that are passed out onto pasture in the faeces. At suitable temperatures, a miracidium develops within the egg, hatches and migrates in thin films of moisture, actively seeking the snail host. Miracidia can only survive for a few hours outside the snail. Within the snail they undergo two further developmental stages, including multiplication, eventually becoming infective cercariae, which emerge from the snail when the temperature and moisture levels are suitable. The cercariae migrate onto wet herbage, encysting as metacercariae, the highly resilient infective stage of the liver fluke. Following ingestion, the young flukes migrate to the liver, through which they tunnel, causing considerable tissue damage. The infection is patent about 10-12 weeks after the metacercariae are ingested. The whole cycle takes 18-20 weeks. The hatching of fluke eggs and the multiplication of snails depend on adequate moisture and temperatures greater than 10ºC. Such conditions usually occur from May to October in the UK although patterns have been changing in recent years. The incidence of fasciolosis is highest in years when rainfall is above average during May, June and July. 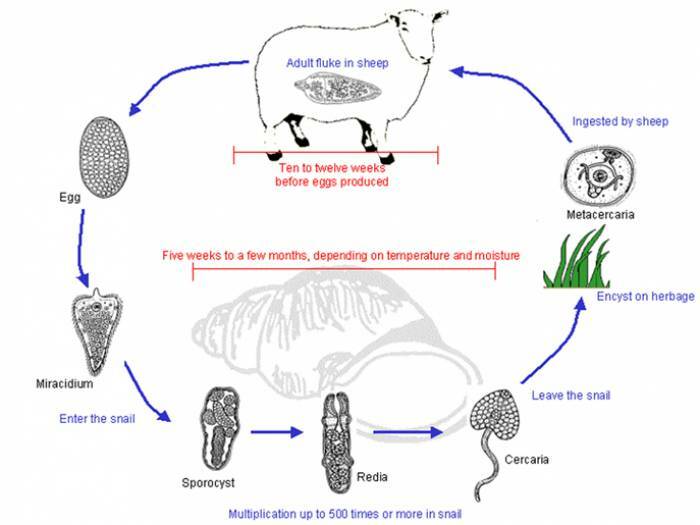 The epidemiology of liver fluke is often viewed as the result of two distinct cycles of snail infection and pasture contamination. Summer infection of snails: In wet summers, snail populations multiply rapidly and snails are invaded by hatching miracidia from May to July. If wet weather continues, the snails shed massive numbers of cercariae onto pasture during July to October. Conversely, if the climate in May and July is dry or cold, fewer snails appear, fewer fluke eggs hatch and levels of contamination in the autumn are much lower. Clinical fasciolosis resulting from summer infection of snails arises usually from ingestion of large numbers of metacercariae over a short period of time in July to October. Winter infection of snails: Less commonly, snails can become infected in late summer or early autumn and development within infected snails is delayed as the snails become dormant and hibernate. The cercariae are then not shed onto the pasture until the following spring. This can produce an initial and significant infection in herds or flocks in the spring. Liver fluke disease in sheep occurs in three main clinical forms – acute, subacute and chronic fasciolosis. Which form occurs depends on the numbers of infective metaceriae ingested and the period of time over which they are ingested. Recent milder winters and wetter summers have seen changes patterns in parasite epidemiology and reported disease with earlier seasonal reports of acute disease. Lifecycle of the liver fluke (Drawings courtesy of Drs Oldham, Jacobs and Fox).